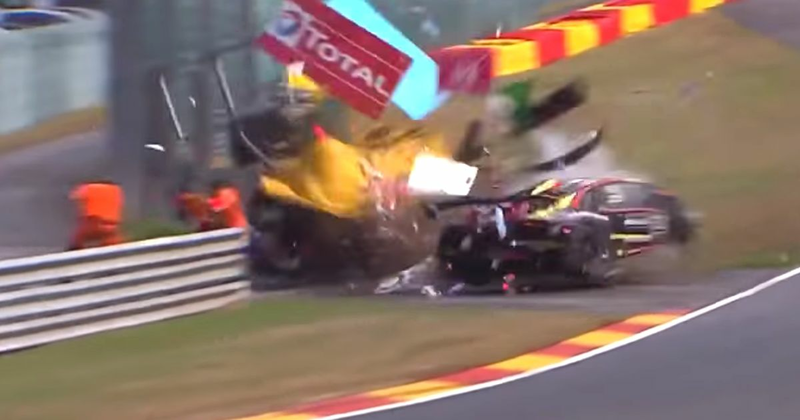 The Lamborghini Super Trofeo series was in action at Spa this weekend, but the race came to a frightening end due to a crash on the way into the Fagnes chicane. Fredrik Blomstedt was leading and making his way through traffic when he got a nudge from behind, spearing his car into the barriers right by a marshal’s post. The race was red-flagged whilst medical crew attended the scene. Remarkably, three of the marshals managed to avoid the incident, but one marshal and Ekblom had to be transferred to hospital. “This morning, during the Lamborghini Super Trofeo support race ahead of the Total 24 Hours of Spa, a vehicle left the track at marshal post 12. Four marshals and one driver were injured in the incident. A remarkable outcome, given the amount of debris flung in the direction of the marshals and the sudden deceleration of the car. Repairs to the barriers took one-and-a-half hours and ironically, because of red flag rules counting back to the last complete lap, Ekblom was declared the winner - despite the crash.